Many developing countries have experienced a sharp rise in income inequality during the past three decades. In the last 15 years, countries like Great Britain and the United States have experienced a major increase in income inequality. Across the United States, the degree of income inequality is associated with a wide range of factors that may influence health, with greater income inequality associated with higher unemployment, higher proportions of people without health insurance, lower per capita medical spending, and lower rates of high school graduation. Wilkinson’s analysis showed that higher-income inequality within the United States and within the selected countries was a powerful determinant of health. Early socialists and others believed that material inequality was an obstacle to a wider human harmony, to a universal human brotherhood, sisterhood, or comradeship. The quality of social relations deteriorates in less equal societies, and thus inequality becomes a powerful social divider. 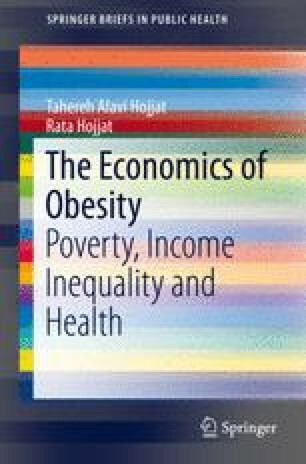 In this chapter, we focus on the question: Does the unequal distribution of income in a society pose an additional hazard to the health of the individual, in terms of obesity, and standard of living in that society?